Explore made-in-Canada John Wood water heaters for heating potable water and home space. Find out about the available models, types and advanced features that save the energy, money, space and time. John Wood water heaters are natural gas- and propane-powered units that are designed for every budget and home. Some houses have a chimney, so atmospheric vent models are the perfect fit. Others do not have the chimney, so power or direct vent can be utilized with the vertical or horizontal pipes. Every gas model was built per standards so they incorporate the Flammable Vapor Ignition Resistant systems to protect the owner and the surrounding from the accidental ignition of the flammable vapors outside the combustion chamber. 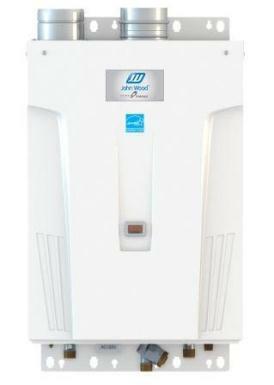 For those who would like to buy energy efficient and Energy Star approved water heaters, John Wood has it. Most of the Energy Star models come with the energy factor of 0.67, while those that are ultra-efficient are designed with the thermal efficiency up to 96%. These are known as condensing water heaters. 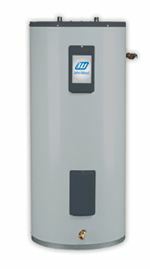 John Wood electric water heaters are designed as the tall standard or conventional type and small, Space Saver models. Large conventional models are built with the capacities from 50 to 100 gallons and can be found as the top and bottom entry models, single or double glassed and high recovery. Space Saver series is for homes with the limited space. They are ideal for apartments, cottages and mobile homes and due to its smaller tank size, they are mainly used for point-of-use service. They are available from as low as 2.5 gallons to large 46-gallon models. All the models come with the innovative TankSaver feature that protects the unit from corrosion while extending its life and insulated Styropour base which minimizes the energy loss. John Wood tankless water heaters include several indoor and outdoor models with the sealed combustion, that are fully modulating gas valve can generate a power from the minimum 11,000 to the maximum 199,000 BTU, and maximum water flow of 10.0 gallons per minute. These on-demand units are built by a Japanese manufacturer Takagi, which ensures the quality, performance and advanced technology while heating the water with up to 50 % less energy than tank-type water heaters. All the models are Energy Star compliant that come with the energy efficiency of 0.82 and up to high 0.91 for condensing models. Check out the review. Oil fired water heaters for residential use are found in 32 and 50-gal sizes and can be used not only for potable water but for space heating. Its universal mounting design allows the installation of most of the burners and is even to retrofit the old ones. Oil-fired heaters are equally good for single homes and buildings with multi-units. Storage tanks with the capacity of 19 and 30 gallons are mainly used in combination with the tankless water heaters for homes where the high demand for hot water is needed. Storage tanks are equipped with the adjustable thermostat and can be connected to the circulator pump from the top. John Wood indirect water heaters are designed in three sizes; 30, 40 and 75 gallons, are equipped with TP valve, anode, thermostat and helical heat exchanger, and are designed for connecting with the boilers with the outputs from 40,000 to 100,000 BTU. Storage booster tanks are equipped with the adjustable thermostat, anode rod for protection against corrosion, TP valve, and top connection to the circulation pump. There are three models available; 40, 50 and 80 gallons.